As any Yankee (or adopted Yankee like me) knows, fall is the glory time in New England—clear crisp days and nights cool enough to light the fireplace. My friend and fellow New Englander, Sarah Leah Chase, knows a thing or two about autumn in the Bay State and she celebrates with a dish members of this barbecue community can relate to: sage-rubbed, wood-grilled pork chops with blue cheese and Concord grapes. According to headlines in my local newspaper, the Cape Cod Times, “A hot September and not enough rain mean a later and less colorful foliage display.” I beg to differ, as I cannot recall such vibrant fall colors on Cape Cod as much I have seen over the past week. I could spend hours meandering up and down the Cape’s historic Old King’s Highway snapping iPhotos of crimson cranberry bogs, mahogany cattails, billowing beach grasses, and deciduous trees cloaked in leafy red, yellow, and orange. Being surrounded by such spectacular natural beauty makes me want to spend as much time as possible outdoors, and at dinnertime this often translates into the urge to prolong my almost nightly summertime grilling as far into November as invigorating sweater weather will allow. Fortunately, my kitchen is surrounded by a large deck overlooking stonewalls and woodland fields and both my Big Green Egg and Weber Genesis grill occupy prominent places of honor, beckoning to be fired up and protesting any inclination toward winter storage. Of course, I adjust my grilling choices to seasonal ingredients and autumnal appetites. Since so many pork preparations scream autumn to me, pork roasts, loins, chops, and ribs hit the grill more often than other meats, poultry, and fish at this time of the year. 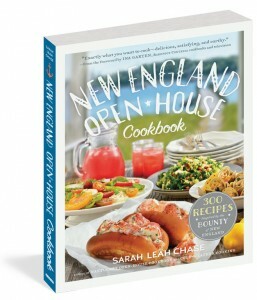 In fact, one of my very favorite recipes to grill right now is the Sage Rubbed Pork Chops with Blue Cheese and Concord Grapes featured in my New England Open-House Cookbook. Concord grapes are at the height of their season in New England and the recipe readily proves that these deep purple grapes are capable of more sophistication than belied by their most ubiquitous use in jars of Welch’s Grape Jelly. While the recipe may sound as well as taste delightfully complex, it is actually quite easy to make, since it does not call for the brining or low and slow grilling required of other pork recipes in my autumn repertoire. I daresay the most persnickety part of the recipe is in taking the time and care to remove the couple of seeds in the center of each and every Concord grape. Should such deter you from attempting the recipe or if Concord grapes are unavailable in your area, other dark-skinned grapes or even seedless (!!!) red-skinned grapes may be substituted, but like wine the flavor of the sauce will vary according to the type of grape used. If you choose your pork chops carefully, they can look just as dramatic on the plate as a veal chop or rib-eye steak, but are much kinder to the pocketbook. I like to use a hefty bone-in pork chop that is at least 1 inch thick. The thickness allows for cutting an ample pocket into the center of the chop to house a pungent nugget of blue cheese, which will melt to oozy irresistibility as the pork chops grill. 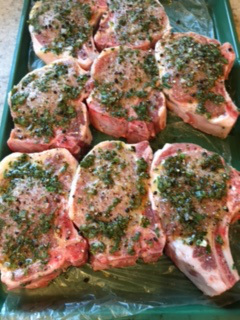 Other than that, the chops are simply seasoned on the outside with a quick fresh herb paste of fresh sage leaves, olive oil, salt and pepper. Grilling may be done over either a charcoal or gas fire. It is important to have a good hot fire in order to achieve beautiful crosshatch grill marks on both sides of the chops, always a sign of grilling prowess. This type of thick pork chop will take a bit longer to grill than the cuts one tends to grill during the hot summer months, since the chops need to be cooked to a barely pink internal doneness temperature of 145°F, easily monitored with an instant-read meat thermometer. Once the chops have finished grilling, they are placed in the skillet used to make the Concord grape sauce, allowing the smoky grilling flavors to mingle and meld with the fruity, balsamic-laced flavors of the sauce. I like to serve the chops with two other recipes from my New England Open-House Cookbook—Smashed Potatoes and Roasted Broccolini with Baby Green Beans. The dinner never fails to provide incentive aplenty to keep the outdoor coals glowing until falling leaves are replaced by the wispy snow flurries. 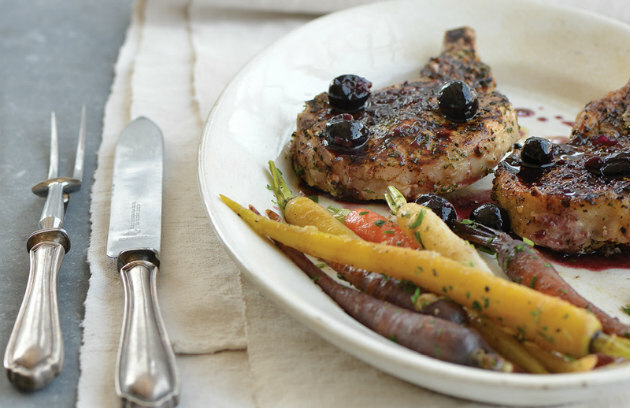 Get the recipe for Sage Rubbed Pork Chops with Blue Cheese and Concord Grapes.